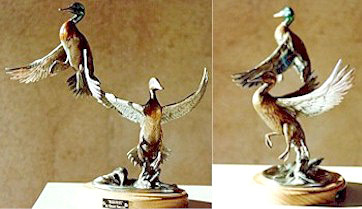 This bronze sculpture by artist Chester Comstock depicts a pair of Mallards just as they explode off a pond. Many outdoorsmen have seen this action and know how quickly the birds are about depart. This item is the perfect gift item for the outdoorsman, hunter or birder who loves these birds. An exciting moment frozen in time by the Audubon of Bronze.